Now that the full Call of Duty WWII launch week has wrapped up we can take a look and see how this release stacks up against previous years. 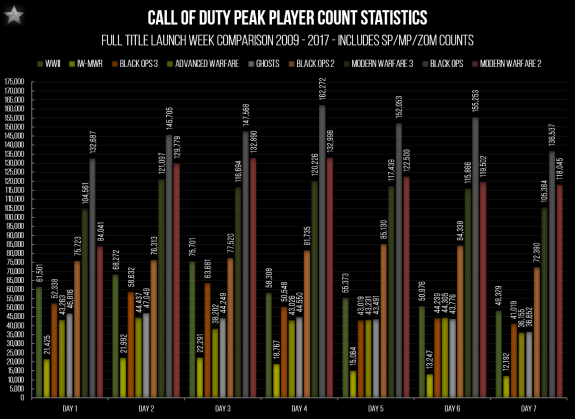 As it’s been talked about already this has been a pretty successful launch for Sledgehammer Games in terms of sales and the player counts even on PC reflect that showing much better launch numbers than previous years. 5 years to be exact. 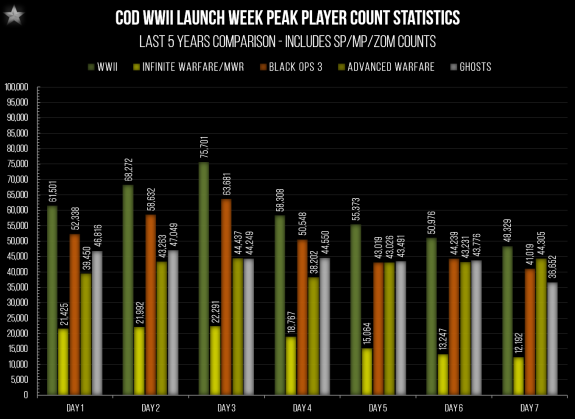 WWII has hit the highest peak since Treyarch’s Black Ops 2 launch – narrowly missing the Black Ops 2 peak on Day 3 of the launch week. 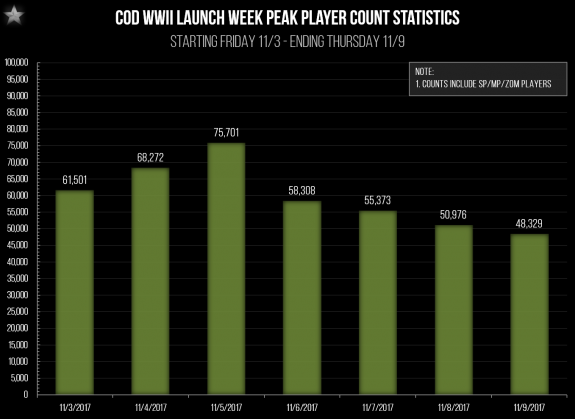 WWII peaked at 75,701 on Sunday the 5th and dropped to it’s lowest at 48,329 on Thursday the 9th. This is good for the PC fan base for a change but it still isn’t breaking the 100K player plus mark of the older titles as seen below. 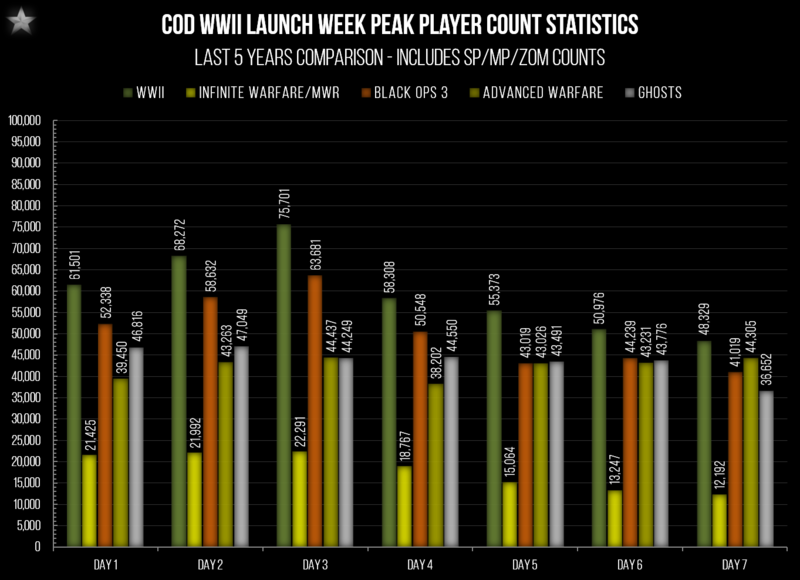 Some graphs below showing actual peak counts for the launch week, a 3 year comparison for the launch week, a 5 year comparison for the launch week and finally; all Steam COD titles for the launch week. The first graph below shows the Steam data for game ownership for Infinite Warfare. Total Owners = 491,097 as of November 6th 2017 – a year after release. The second graph below shows the Steam data for game ownership for WWII. Total Owners = 450,851 as of November 10th 2017 – just one week after release. 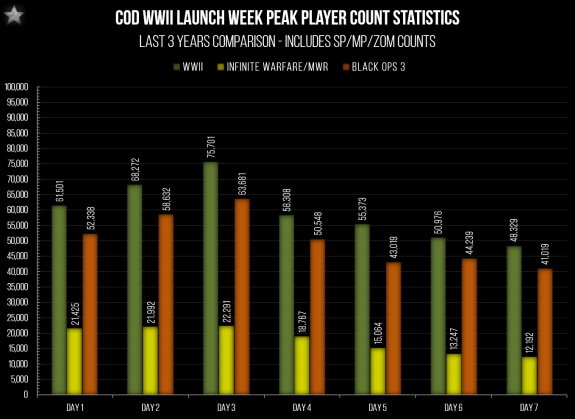 The third graph below shows the Steam data for game ownership for Black Ops 3 just for some perspective. 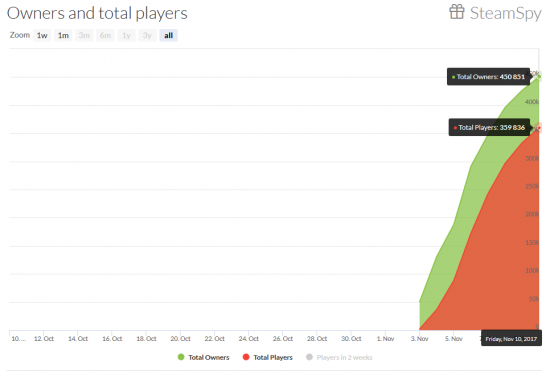 Total Owners = 1,700,315 – two years after release. COD:WWII is just under 50,000 units away from beating Infinite Warfare in just one week on the PC platform. Just over $27 million dollars of revenue from the PC alone at the base price of $59.99. That launch seems huge to me but seeing those sales numbers I would tend to think that the initial peak player counts would have been even higher. 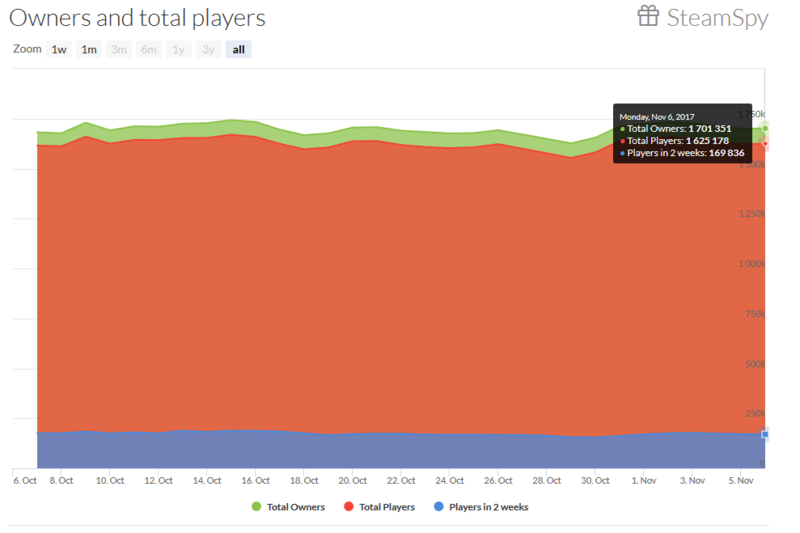 However looking at the second graph for WWII it also shows Steam data for active players over the last two weeks – and there is a chunk missing. Doing the math there it seems that although nearly 451K people purchased the game – almost 91K people out of that group haven’t even played it. 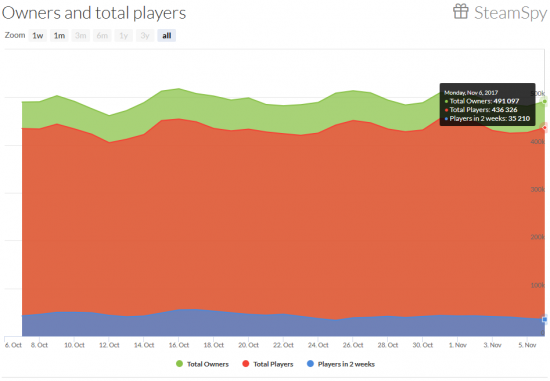 According to SteamSpy data only 58% of purchasers played Single Player and 78% of purchasers played Multiplayer as of the time I am writing this article. With that being said the launch numbers could have been even better! All in all with a pretty big launch – and even on PC; it looks like it could be a decent year for Call of Duty. The launch numbers are there for a change but I still question if the audience can be sustained long enough. With talks of a first big patch today it should be interesting to see how SHG and Raven continue supporting the game. I have mixed feelings on that right now as well as on some of the implementations coming but we can only wait and see. I’ve held off purchasing up until this point; mainly because I wanted to see where player counts landed and I do see split reviews on the game yet. I’ll see how this patch rolls out yet but most likely I will purchase over the weekend – without the Season Pass. 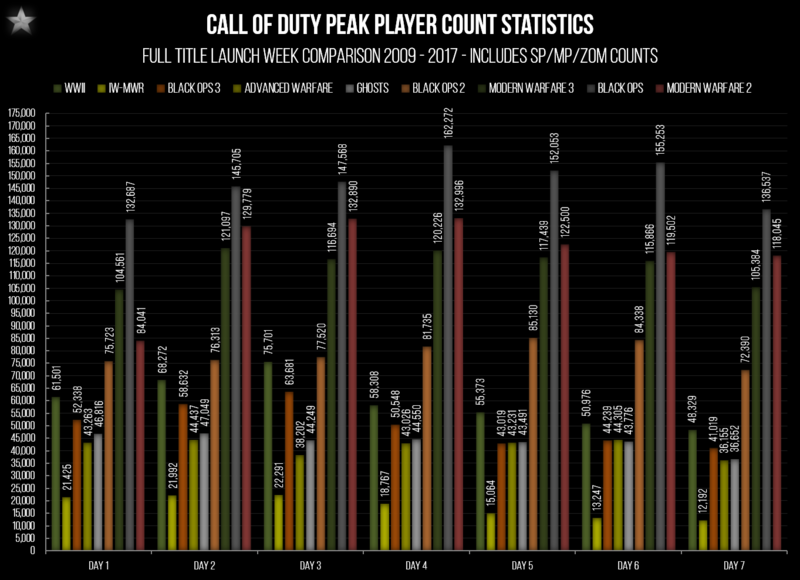 Another Call of Duty launch is upon us and with the weekend over that means we have our first look at how Call of Duty WWII performed initially in terms of players – a big driving force for me to purchase or pass this year wanting to play more that TDM and DOM. I’ll update this post later on with complete numbers and full comparisons to previous years when we actually wrap up the full launch week on Friday. 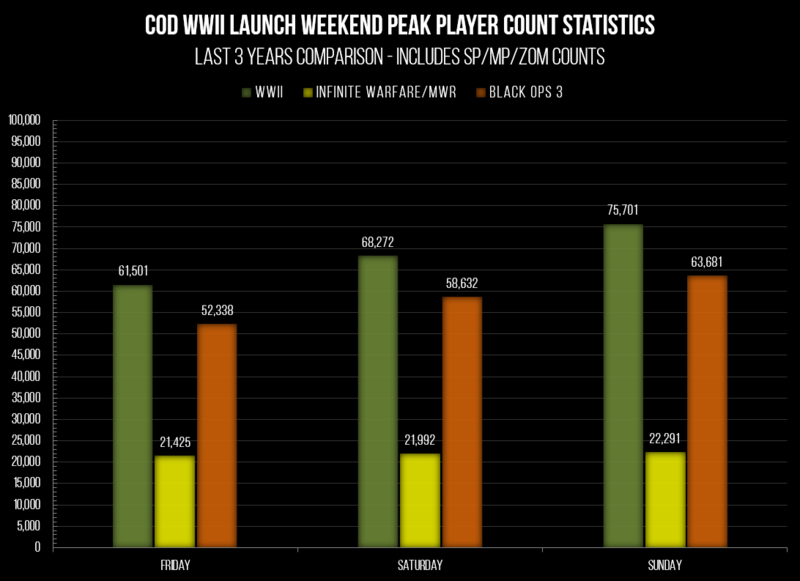 Like previous years the weekend starts with the “surge” of players usually hitting a max on Saturday and Sunday and then there is a gradual decline throughout the first week on. To keep it pretty short and sweet – Call of Duty WWII has had the best launch on PC in years just looking at the weekend picture. The only minor note to this is that there were numerous issues on the connectivity/server side of things with servers being down multiple times over the weekend period. I don’t believe the numbers are really affected by those down times however looking at daily traffic flow and the hours that dip but it is worth pointing out. There are always some level of issues at launch for a COD title but it did seem a little worse this year across all platforms from what I was seeing. However in reality it truly could have been from having more players than expected causing too much stress on the network & backend systems. Not really a bad problem to have – but also when you have to start stripping core things out of the game just to get performance stable then that is not exactly great. There are some other outlets reporting on sales numbers across the board and it’s interesting to look this info but sales numbers are always a little questionable because there doesn’t appear to be a proper resource for accurately tracking them – and Activision isn’t usually willing to just spill all the beans and provide real numbers themselves either. Whatever the case it’s being reported by GamesIndustry that WWII has already “crushed” Infinite Warfare’s first week sales by 57%. Now I’m not saying that I don’t believe it – because I do – Infinite Warfare performed very poorly. I just take it lightly because it’s not solid data but just bits and pieces and some guess work thrown in at the end. They are only discussing UK sales, they only have numbers for physical sales and they are guessing at digital sales. It’s not really the whole picture. This is why I focus more on active player counts across the board and over the years. However with some new Steam data available we can start to get a better picture of “total owners” of the game as well which is another good statistic to have year to year on the PC. More on that once we wrap up the full launch week.